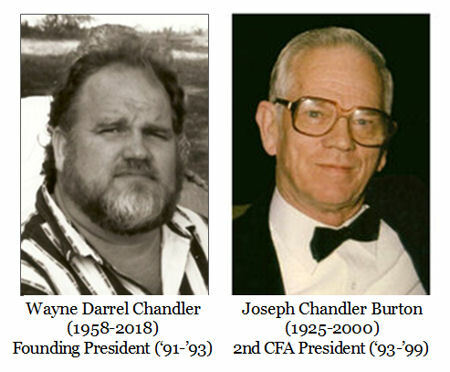 In mid-1990, five Chandler descendants from different geographical locations met by coincidence by mail, telephone, and in person while seeking Chandler roots in northeast Georgia. The five — Wayne Darrel Chandler of Jacksonville, Florida; Kay Reed Bedford of Roundup, Montana; Harold Nelson Chandler (1915-2008) of Punta Gorda, Florida; James Booth “Jim” Reeves (1922-2012) of Glen Burnie, Maryland; and Joseph Chandler Burton, Jr. (1925-2000) of Anderson, South Carolina — were all descendants of John Chandler born 1600 in England who arrived in Jamestown, Virginia, in 1610 (DNA Group 7A). They determined to form an association to further research their Chandler heritage. Shortly thereafter, Thom Chandler, Lakeland, Florida, and Bob Davidson, Richmond, Virginia, joined to share their valuable research and expertise. See Founders photo. On January 1, 1991, a charter and by-laws were adopted by some 30 charter members. In November 1991 Thom Chandler published the first Chandler Family Association Newsletter . In March 1992 the CFA published its first genealogical article, and, in 1997, a comprehensive history of Chandlers in the American Revolution was compiled by Nelson Chandler and distributed to members. Recent research has extended our knowledge of John Chandler born 1600. Jim Reeves, former CFA vice president and librarian, maintained lists of descendants of John Chandler born 1600 and other Chandler lines for more than 20 years. Jim retired as a CFA officer and from the database project as of the 2008 annual meeting. His work has been imported into a modern database now known as the Chandler Family Association Lineages Database (CFALD) which is an important resource for Chandler researchers. The first Chandler Family Association annual meeting was held at Chandler’s Ferry in Hart County, Georgia, in September 1991 with about 50 in attendance. Since then the meetings have been held in various locations around the southeast and in Texas; Gettysburg, Pennsylvania; and Williamsburg/ Jamestown, Virginia. See a complete list of meeting locations since 1991. The CFA Newsletter is now delivered three times annually to CFA members and a number of libraries, genealogy repositories and associations. See the Membership page for current membership numbers and information on joining the CFA. Membership in The Chandler Family Association is open to all Chandler descendants and anyone who is interested in Chandler genealogy. We invite you to join us in celebrating our Chandler heritage. 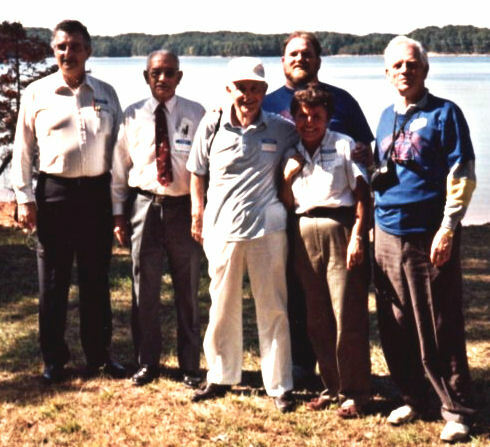 From right, founders Joe Burton, Kay Bedford, Wayne D. Chandler (in back), Nelson Chandler, and Jim Reeves are shown with Thom Chandler (extreme left), one of the first members and the first CFA Newsletter editor, at the first CFA meeting in 1991 at Chandler’s Ferry in Hart County, Georgia. Photo courtesy of Wayne D. Chandler.